Heat oven to 325°F. Spray bottom and sides of 8- or 9-inch square pan with cooking spray. In 1-quart saucepan, melt 1/4 cup butter over medium heat, stirring occasionally. Stir in brown sugar. Heat to boiling; remove from heat. Stir in 1/2 teaspoon cinnamon. Pour into pan; spread evenly. 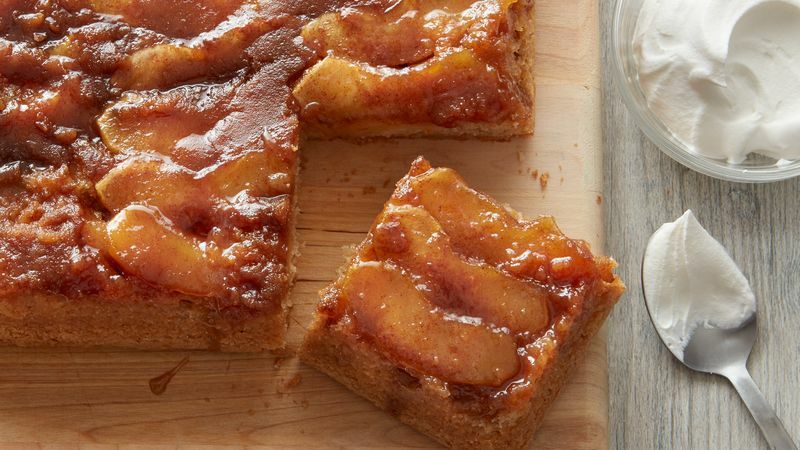 Arrange apple wedges over brown sugar mixture, overlapping tightly and making 2 layers if necessary. In medium bowl, mix flour, baking powder, 1/2 teaspoon cinnamon and the salt; set aside. In large bowl, beat 1 cup granulated sugar and 1/2 cup butter with electric mixer on medium speed, scraping bowl occasionally, until fluffy. Beat in eggs, one at a time, until smooth. Add vanilla. Gradually beat in flour mixture alternately with milk, beating after each addition until smooth. Spread batter over apple wedges in brown sugar mixture. Bake 55 to 65 minutes or until toothpick inserted in center comes out clean. Cool on cooling rack 15 minutes. Meanwhile, in medium bowl, beat whipping cream on high speed until it begins to thicken. Gradually add 2 tablespoons granulated sugar, beating until soft peaks form. Run knife around sides of pan to loosen cake. Place heatproof serving plate upside down over pan; turn plate and pan over. Remove pan. Serve warm cake with whipped cream. Store cake loosely covered. To serve leftover dessert warm, scoop servings into small microwavable bowls and microwave individual servings on High for 15 to 20 seconds.